Guinness offers an insight of the Sapeurs, those men from Congo Brazza who express themselves through clothing. Chef Ahki Guides us around her favorite Health Food store in Atlanta, Georgia with tips and ideas. 6 millions people killed since 1996. Produced by The Tutankhamun Brothers, this mixtape embodied what The Beatles and Kanye West would have sound like if such a collaboration were to be. Enjoy! “This unique collaboration between the FOLORUNSHO creative collective and basketball – street wear brand K1X DCAC BATIK Edition features 20 unique and handmade batik sneakers, each limited to 20 pairs worldwide. 20 street kids from Freetown (Sierra Leone) created a stunning variety of patterns using traditional (and improvised) batik techniques. Each of these personally designed fabrics were then made into 20 one-of-a kind sneakers. Every pair of the handmade pieces is absolutely unique, named after their maker and limited to 20 pairs per style (sizes 5,5 thru 12) at a retail price of $200. Each pair comes with a coffee table book that documents the production of this handcrafted collaboration. LION BASE is a documentary photo book that provides an intimate perspective at the raw life in the streets of postwar Freetown, Sierra Leone documenting the life of 20 youths that were living under horrendous circumstances in a gutter called LION BASE. The books stunning imagery invites you into a reality that most of us are unable to imagine. 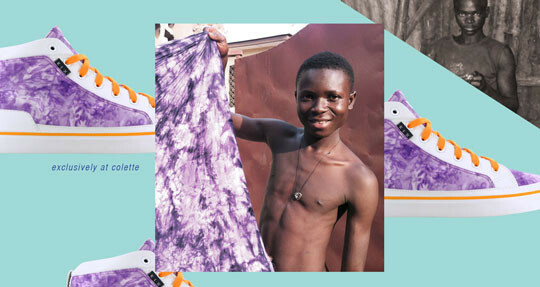 It follows the life of these youths and shows their development: emerging from a life of violence and crime in the streets into forming the creative collective FOLORUNSHO, whose products and international collaborations are now available in selected locations around the world such as Collette in Paris. It shows the transformation from a “struggle for existence” to “creator of one‘s own life” by overcoming boundaries and obstacles and transforming the “impossible” to I‘M POSSIBLE.